There are an abundance of quality rock routes for all abilities in the Whistler to Squamish corridor, which make it one of the best destination climbing areas in Canada. Most famous are the long, multi pitch routes on the 650 meter (2145 feet), granite massif, called the �Chief�. Splitter cracks, classic finger and hand jams, low angled friction climbs, off widths, steep face climbs, overhanging jugfests - you name it, we�ll take you to it! 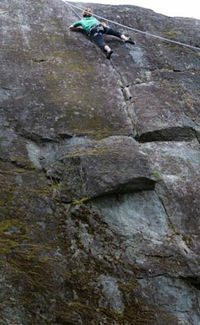 We guide and instruct both sport and traditional rock routes. A famous song once stated �Climb every mountain�.� and it was right. When visiting Whistler in the summer months, that�s exactly what you should do. There are so many different ways to climb in Whistler and so many rock faces to tackle, you�ll need a lifetime of holidays to do them all! After experiencing the exhilaration of reaching the top of a rock wall using your own two hands and feet, that�s exactly what you�ll want to spend your summer holidays doing. Sometimes chairlifts feel like cheating, so when you head out in Whistler, Pemberton, or Squamish for a climb, let�s face it, you�re experiencing the mountains firsthand. For a sneak peek of what climbing is like if you�ve never done it before, a great place to start is at the indoor climbing gym in Whistler Village. You can practice on the bouldering wall without ropes, or pop into a harness and climb with a belaying partner up the numerous indoor pitches. You�ll see what it�s like to climb up overhangs from the safety of an indoor gym. Once you have a handle on things, it�s time to get outdoors and start climbing the real thing. Squamish boasts the Stawamus Chief, an imposing rock face that looms over the beautiful Squamish landscape at heights of up to 500m. The face has over 1500 climbing routes from beginner to advanced. Once again I stress that you need a lifetime of holidays to experience the amazing climbing around Whistler. There are all sorts of lead-climbing options, and many top-roping spots too. Between Squamish and Pemberton, there are a multitude of climbs and there�s even a crag in Whistler�s Nordic neighbourhood that�s worth checking out. The rest of the climbing spots can be found along the Sea-to-Sky corridor from Vancouver to Pemberton and beyond. All of these spots are an easy drive from Whistler and the Whistler Alpine Guides Bureau provides guided tours for all levels of climbers. In Pemberton you�ll be climbing with views of Mount Currie (you can�t miss it when you�re in the Pemberton Valley,) as mountain bikers whiz down the slopes nearby. You should probably stop at the local bakery for a croissant and coffee after you�ve climbed some of Pemberton�s challenging faces. Breaking away from what one might consider more traditional climbing options, visitors can sign up for a climb technique called Via Ferrata. With some guides, the equipment they provide, and a handy route up Whistler Peak, you�ll be climbing up to the Peak with little to no experience but boatloads of fun. Don�t forget a camera though, because the view from Whistler Peak is unforgettable. Via Ferrata means �iron way,� so don�t forget to bring your iron lungs for the incredible climb. So, as the song says, �climb every mountain,� but in Whistler you won�t have to search high and low for where to go, because here at www.ResortAc.com, we�ve got you covered. Also, try the newest climbing style in Whistler. 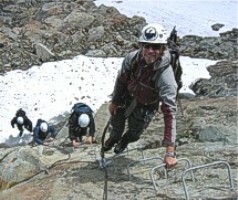 Via Ferrata - Whistler�s most exciting new adventure!! Experience a unique 5-hour excursion to the summit of Whistler Peak, providing exhilarating views and a vertical perspective you may not have thought possible! "Via Ferrata" is Italian for "Iron Way" and is a climbing route with permanently fixed cables for protection and metal ladder rungs to ease your movement over rock.This tour combines a glacier walk and rock climbing without having to be a rock climber. No experience is necessary. Whistler activity discounts on Rock Climbing & Hiking Tours here... We guarantee the lowest Whistler Rock Climbing & Hiking tour prices, so reserve online today and save your time and money. 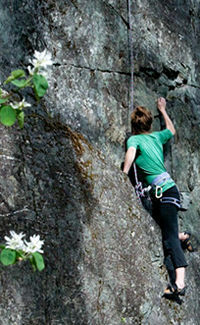 Follow this link for Whistler Rock Climbing & Hiking Tour discounts.